Save Marinwood-Lucas Valley - our community, our future: Lesson for Marin: Citizen Fight in Colorado. Lesson for Marin: Citizen Fight in Colorado. 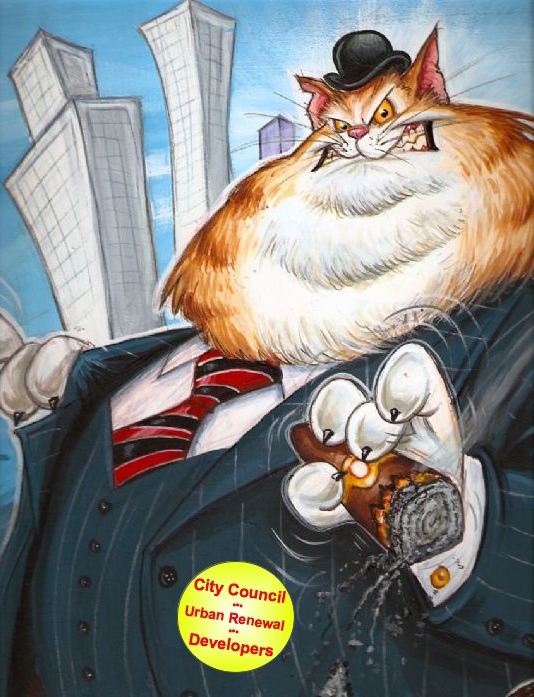 Cronyism, corruption, corporate welfare, corporate socialism, elitism, insider deals, political payoffs, central planning, social engineering … the worst of what can happen when politicians, government bureaucrats and business fat cats get together under the auspices of your local ‘urban renewal authority’. In recent years we have seen the Arvada Urban Renewal Authority (AURA) go on a tax give-away binge and engage in heavy-handed regulation for the benefit of favored developers; behavior that has gone far beyond what the ‘urban renewal’ concept was ever meant to accomplish. Perhaps most egregious is the strong-arm power of urban renewal authority that distorts and manipulates the functioning of the free market. Local established businesses and historic neighborhoods are thus artificially impacted in ways from which they may never recover. In just the past couple of years in Arvada we have witnessed the city council and AURA applying elitist “we always know what is best for you” decisions in the central region of the city especially. The whole urban renewal process often descends into what amounts to sanctioned bribery and graft when developers get rebated millions and millions of tax dollars to build projects desired by government — where otherwise the free market would render its own organic resolution and judgement. Any such system is ripe for abuse: thus, not unexpectedly, we have seen in city council elections, proponents of city government largess tending to receive campaign contributions from their developer ‘friends’. and it has come to mean government subsidies of tens of millions of dollars to private developers. The Arvada Urban Renewal Authority has become a scandal … but, the concerns of city residents are belittled and ignored. What are the typical responses of the elected elite, the establishment politicians and their cronies to this tax give-aways and favoritism towards wealthy developers? Why, we common folks just don’t understand the mechanics of city planning and how government and business have to ‘work’ together. We are naivé to think that this isn’t how big, important deals are made … and besides, what do you know about what is best for the future of Arvada? And then there is the slickest line of all: if government doesn’t give developers tax money, they wouldn’t be able to afford to build and ‘improve’ the city. Next time you need to repaint or re-roof your house, go to city council and try that reasoning on them — ask for three of four years of city sales tax rebate so you can afford to ‘improve’ your neighborhood. Lately, however, citizens across the metro area are waking up to this abuse of government power that favors special interests over free markets and taxpaying residents. In Littleton, a grassroots effort of citizens has succeeded in putting on a city special election ballot a proposal to rein in the overreach of city hall and urban renewal: Gloves are off in urban renewal battle royale – Denver Post. In Westminster, an incumbent city council representative has authored a hard-hitting critique of how urban renewal is being utilized in that city: Westminster abusing ‘blight’ designation for TIF-funded urban renewal by Bruce Baker. In Arvada average citizens are seeing growing online and grassroots interest in local government reform that puts AURA abuses front-and-center. At issue are pending and proposed tax subsidies worth millions and millions of dollars — Walmart $5.8 million; Park Place Olde Town $3.3 million; Solana Olde Town (apartments) $7.2 million; Renascent/Hilton Hotel $8.6 million. See: Stop Arvada Walmart/Facebook; Save Arvada Now/Facebook; Arvada for ALL the People/Facebook. Residents of Arvada, Westminster, Littleton — indeed, the entire Denver region — all want good quality economic prosperity for our communities. Undoubtedly, however, most regular folks also believe that free enterprise, fairness and the ‘old fashioned’ American way of doing business should not be subverted by government favors and preferences for a chosen few picked to be ‘winners’ by urban renewal authorities. Did Marinwood-Lucas Valley lose a Con Game?